The Government of Ethiopia is committed to transitioning to a middle-income country by 2025, and electrification plays a key role in that plan. Power Africa's support includes increasing installed generation capacity through private sector investment and increasing connections in cooperation with the World Bank's National Electrification Program. According to Dan Waddle, senior vice president of NRECA International, "Past electrification efforts throughout Africa would inevitably fall short or stall for lack of financing and political will. 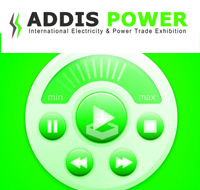 thiopia is endowed with huge renewable energy potentials and currently it has been aggressively engaged in increasing national energy generation, transmission and distribution capacity to satisfy domestic demand whilst surplus production ready to export market to supplement its foreign currency earnings and enhance regional economic integration. Apart from renewable energy sources, Ethiopia reached agreement with Russia tobuildanuclear facility and nuclear research instituteduring country's Foreign Minister Sergey Lavrov recent visit.